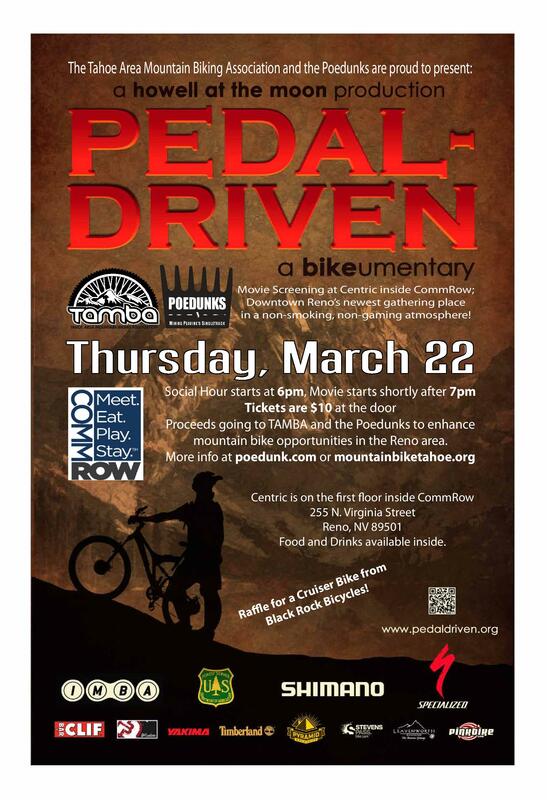 Reno, NV – The Tahoe Area Mountain Biking Association(TAMBA) and the Poedunks are presenting “Pedal-Driven: a bike-umentary”, a new documentary film from Howell at the Moon Productions. The screening will take place at Centric inside CommRow on Thursday, March 22, 2012 at 7pm. It will be preceded by a social hour starting at 6pm. Tickets are $10 and the proceeds will go to both organizations to promote sustainable trail building efforts in the area. The central story line takes place in the small town of Leavenworth, Wash., but shooting for the documentary occurred over an 18-month period in every Western state and in Canada. “We searched far and wide to find powerful examples of solutions to these issues that are actually in place and working right now,” said executive producer Jeff Ostenson. TAMBA is the largest mountain biking organization in the Tahoe region with over 350 members and focuses its efforts on volunteer trail work, cooperation with land managers, and education of trail users. They organized over 1000 hours of volunteer trail work last year, working side-by-side with the US Forest Service and Nevada State Parks on several projects. The Podunk’s mission is to maintain and enhance Peavine’s non-motorized trail network by volunteering to do trail maintenance, trail construction and mountain clean ups and working with the U.S. Forest Service, Washoe County Parks, the City of Reno, and other Peavine user groups.